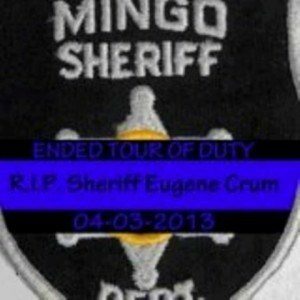 The Patriot Guard Riders have been invited to stand up a flag line of honor for Sheriff Walter “Eugene” Crum, who tragically lost his life in the line of duty while serving the citizens of Mingo County on April 3, 2013. He had recently been elected to his new position as the Sheriff, and was a fine man who was deeply respected by all. This is going to be a high-visibility event with multiple law enforcement agencies sending representatives. We would ask you keep the Crum family in your thoughts and prayers during this difficult time. Please remember to bring your 3×5 flags as we stand to honor this fallen hero. Flexibility and patience will be key at this mission. Our presence has been coordinated with the Cabel County Sheriff and his representatives (they are in charge); we will abide by their desires and instructions. As parking will be very limited, he would prefer we bring bikes, but if a cage is your primary means of conveyance, come anyway. The Cabel County Sheriff anticipates there may be as many as 500 police vehicles present…there will be a huge turnout for this funeral.